Even Great Presentations Have Their Moments…. Does this graph portray the data accurately? Is a circle graph appropriate here? Why or why not? How can we re-display the same information effectively using a new circle grpah, or a different type of graph? Team: We are all very good players. Team: We will beat Shelbyville. Hypnotist: You will give 110 percent. Team: That’s impossible no one can give more than 100 percent. By definition that’s the most any one can give. This entry was posted in Middle School, Statistics and tagged circle graphs, statistics. Bookmark the permalink. 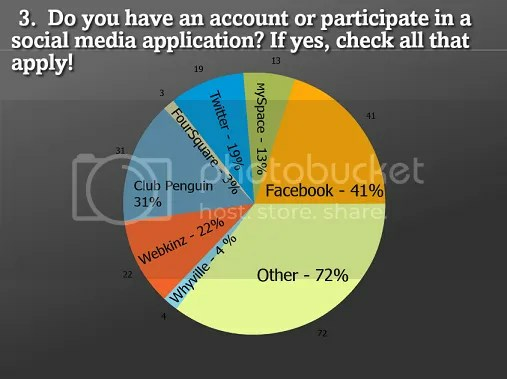 I a gillion-percent agree that 72% seemed a bit high for “other”, but I think there could be confusion over what is considered a “social media application”.